On the spending side, the Democrats’ headline concession will be accepting chained-CPI, which is to say, accepting a cut to Social Security benefits. 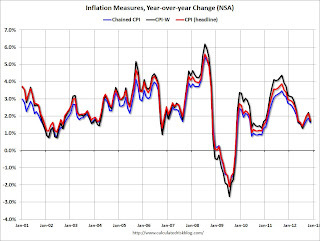 Chained CPI is a relatively new series (started in 2002), and measures inflation at a slightly lower rate than CPI or CPI-W - and over time this would add up both for Social Security payments and also for revenue (tax brackets would increase slower using chained CPI than using currently). 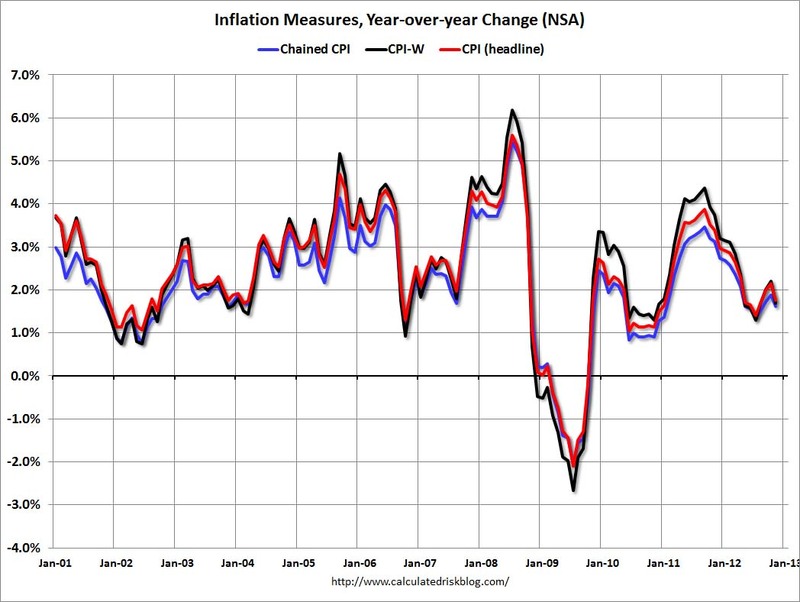 The graph shows the year-over-year change in headline CPI, CPI-W, and chained CPI. There isn't much difference on a year-over-year basis, but notice the blue line is mostly below the other two all the time. Those small differences add up over time as the following table shows. This table shows the 10 year change in each measure (from Nov 2002 to Nov 2012) and the annualized change over that period. If we were using chained CPI instead of CPI-W over the last 10 years, Social Security benefits would be about 3.6% lower than they are now.